Johns Hopkins scientists have developed a reliable method to turn the clock back on blood cells, restoring them to a primitive stem cell state from which they can then develop into any other type of cell in the body. The work, described in the Aug. 8 issue of the journal Public Library of Science (PLoS), is “Chapter Two” in an ongoing effort to efficiently and consistently convert adult blood cells into stem cells that are highly qualified for clinical and research use in place of human embryonic stem cells, says Elias Zambidis, M.D., Ph.D., assistant professor of oncology and pediatrics at the Johns Hopkins Institute for Cell Engineering and the Kimmel Cancer Center. “Taking a cell from an adult and converting it all the way back to the way it was when that person was a 6-day-old embryo creates a completely new biology toward our understanding of how cells age and what happens when things go wrong, as in cancer development,” Zambidis says. “Chapter One,” Zambidis says, was work described last spring in PLoS One in which Zambidis and colleagues recounted the use of this successful method of safely transforming adult blood cells into heart cells. In the latest experiments, he and his colleagues now describe methods for coaxing adult blood cells to become so-called induced-pluripotent stem cells (iPS) — adult cells reprogrammed to an embryonic like state, and with unprecedented efficiencies. Zambidis says his team has managed to develop a “super efficient, virus-free” way to make iPS cells, overcoming a persistent difficulty for scientists working with these cells in the laboratory. Generally, out of hundreds of blood cells, only one or two might turn into iPS cells. Using Zambidis’ method, 50 to 60 percent of blood cells were engineered into iPS cells. Zambidis’ team also found a way around the use of viruses to convert the cells to a stem cell state. Traditionally, scientists use viruses to deliver a package of genes to cells to turn on processes that convert the cells from one type (such as skin or blood) back to stem cell states. However, viruses used in this way can mutate genes and initiate cancers in newly transformed cells. To insert the genes without using a virus, Zambidis’ team uses plasmids, rings of DNA that replicate briefly inside cells and then degrade. The blood cells were also given an additional new step in which they were stimulated with their natural bone-marrow environment. For the new study, the Johns Hopkins team took cord blood cells, treated them with growth factors, and used plasmids to transfer four genes into them. They then delivered an electrical pulse to the cells, making tiny holes in the surface through which the plasmids could slip inside. Once inside, the plasmids triggered the cells to revert to a more primitive cell state. The scientific team next grew some of the treated cells in a dish alone, and some together with irradiated bone-marrow cells. When scientists compared the cells grown using the blood cell method with iPS cells grown from hair cells and from skin cells, they found that the most superior iPS cells came from blood stem cells treated with just four genes and cultured with the bone marrow cells. 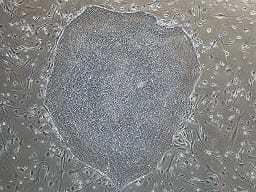 These cells converted to a primitive stem cell state within seven to 14 days. Their techniques also were successful in experiments with blood cells from adult bone marrow and from circulating blood. In ongoing studies, Zambidis and colleagues are testing the quality of the newly formed iPS cells and their ability to convert to other cell types, as compared with iPS cells made by other methods. Efficient methods to produce virus-free iPS cells may speed research to develop stem cell therapies, using nearly all cell types, and may provide a more accurate picture of cell development and biology.